BikeBlog: last weekend was also the idiotardod. 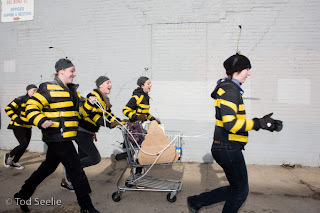 The bees...from 2008 Idiotardod...photos by Tod Seelie. 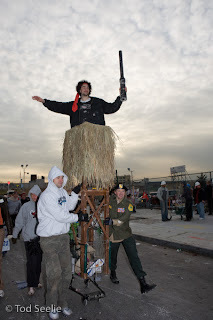 I just feel obligated to briefly mention the idiotarod, only because it was my first posting of bike blog back in January 2005. 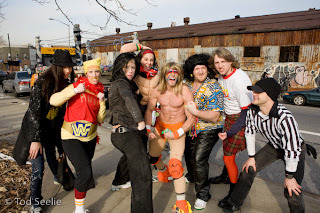 The idiotadrod is this shopping cart race where teams of 5 dress up in costume and run through the streets of NYC. It happened on Saturday, January 26th, 2008. 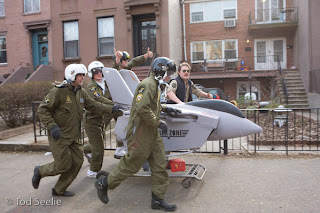 My favorite cultural photographer: Tod Seelie summed it all up in some really nice photos. One of my favorite teams...with there F14 fighter jet...the Danger Zone. 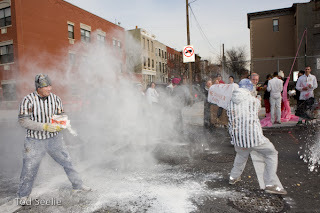 Idiotarod always turns into this big condiment war at the end because people carry all kinds of food-fight items for sabotage. Flour is also very popular. So somebody went to the trouble of having a portable wrestling ring on the back of a flatbed truck, complete with its own refs and Ultimate Warrior. Also, nice going with the Rambo cart, with lookout tower. Seems impracticable for a race...what am I saying...this is idiotarod. Great video with Anney Fresh.